Sammy Clingan last night bagged a brace from the penalty spot to help Glenavon pocket three crucial Danske Bank Premiership points at The Oval. The Lurgan Blues have now cut the gap on table topping Coleraine to just five points. But it was another night of misery for Gary Haveron’s Glentoran, who are shipping points now at an alarming rate. They did start well with Robbie McDaid firing them into an early lead. But once Andy Mitchell levelled, the writing was on the wall for the home team. Clingan did the needful with a second half double to keep Glenavon firmly in the title frame. The Lurgan Blues were celebrating after only three when Marc Griffin finished off a Mitchell knock down, but referee Andrew Davey had already spotted the big striker had already handled. Glentoran responded in the proper manner by roaring into the lead 60 seconds later. McDaid showed great awareness after Dylan Davidson had sent Curtis Allen scampering free on the left and his cross was superbly touched home by the striker. But the home celebrations were still going on when the visitors levelled. The tricky Josh Daniels whipped in from a great cross from the left which was helped on by Andy Hall and big Mitchell gobbled up his 11th goal of the season with the flick of his head. With is confidence now soaring, Mitchell warmed the hands of Elliott Morri with a stinging low shot before Sammy Clingan held his head in frustration after the veteran Glens’ shot stopper managed to get his finger tip to the midfielder 30 yard drive. It was the Lurgan boys who began to turn to screw. Morris was again call on to touch away a teasing shot form Bobby Burns, that was creeping in at the base of the post. Burns then turned provider, sending in an inch perfect free kick onto the head of Andy Hall, but his effort looped harmlessly over the top. Amazingly, the Glens almost forged ahead again just three minutes after the break when Tiernan McNicholl’s delicious cross from the right ws met by Allen, but his header was brilliant pushed to safety by Johnny Tuffey. But the home team managed to shoot themselves in the foot 16 minutes from time when Tre Stirling tripped the lively Mark Sykes inside the box and referee Davey was perfectly position to award the penalty. The experienced Clingan stepped up to send Morris the wrong way from the spot. Glentoran then had a let off when referee Davey ruled who what looked like an own goal from Johnny Addis, awarding a free kick against Mitchell for pushing. But the visitors sealed the points eight minutes from time when Clingan agian showed how deadly he was from the spot, this time after Ross Redman had handed a Simon Kelly header. GLENTORAN: Morris, Kane, Sterling, Addis, Kelly (Ferrin 54), Allen, Knowles, Davidson (Nelson 77), McNicholl, Redman, McDaid (McDaid 83). 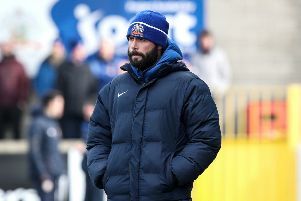 GLENAVON: Tuffey, Burns, Kelly, Doyle, Daniels, Marshall, Mitchell (Jenkins 89), Griffin (Hamilton 73), Hall, Sykes, Clingan. Unused subs: McCrory, O’Mahony, Lindsay.